On gp2x F100 you can push any buttons of the dpad to move the cursor and push [B] to simulate a click. On gp2x F200 you can use the touchscreen to move and click. [HOME] - Exit the program (or quit the save screen). 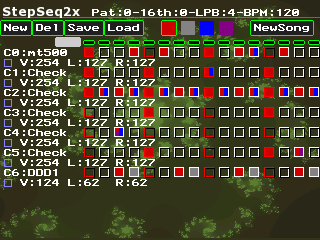 [VOL+/-] - Change BPM or selected values appearing usually in red on the screen. [L/R] - Depends of the mode selected using [Y], modify LPB, pattern location, display the second screen or scroll the channel list. [A] - Pattern copy mode. [X] - Pattern paste mode or exit the current menu selection. [B] - Simulate a click or validate menu selection. [Y] - Cycle trough stepSeq2x [L/R] mode.